Did you know that putting and chipping make up approximately 56% of your score. Learn the secrets of the masters. They spend their time perfecting their chipping and putting techniques. Find out how to fast track your way to lower scores. You will learn the correct technique to ensure success. You will learn what controls the distance your ball travels. Also covered is how to develop a consistent stroke and why it is important. The etiquette of the game is explained in a common-sense manner which is easy for everyone to understand – even if you have never played golf before. You will learn how to avoid getting into situations which are considered just “not done” on the golf course but no one has ever told you. This is meant to be a practical guide to being “in the know” when it comes to golf. You will learn about the TEN RULES needed to play golf. If golf is 90% mental, then why do we spend all of our time learning the technical skills? All of the top professionals practise mental skills and strategies as diligently as their technical skills. They are learning to utilize the power of their mine. This in turn, allows them to perform to the best of their ability. You will learn how performing requires that you use as many senses as you can. You will learn how to practice “mentally” and the benefits from this. You will practise “visualization techniques” and positive self-talk. You will learn how the best players formulate a “strategy” for success. Techniques for focusing in the moment will be utilized. Can you think of a better way to “give back” to those special clients or prospects? You can spend 2 hours of quality time, learning about golf with your guests. A valuable experience. This session is at a local golf course where you will learn the keys to playing and having fun in a “scramble” format tournament. You will learn about the golf course, scoring, the player assistant (Marshall), golf cart etiquette and how to play quickly and courteously. A blend of mental & physical stages that lead you to the right position and frame of mind to hit the ball where you want it to go. You need a pre-shot routine to let you in and out of focus as required. The majority of this session will be spent developing your pre-shot routine. This session will help you to build confidence through gaining control. This powerful session can dramatically impact your golf game. It is appropriate for golfers with experience. THE ART OF SCORING (COURSE MANAGEMENT) 2 HOURS & 9 HOLES OF GOLF. Join Jeri to find out how you can utilize your strength to maximize your distance on the golf course. Palm Springs, Sandpiper, Bowen Island and Mesquite, Nevada? Choose your destination. Jeri offers getaways for gals, guys, or couples where you can relax and rejuvenate your game and have a blast with like-minded golfers. Yoga for golf can be included. Have you always kinda, maybe, sorta wanted to give golf a try but aren’t quite sure how to go about it? Would you like to have some idea of what you’re doing before taking that first step onto a golf course? Well here’s your chance. Golf is as much about what we “think” we are doing as it is about what we are actually “doing”. Join LPGA Golf Professional, and Neuro Linguistic Practitioner, Jeri O’Hara in a seminar designed to introduce you to how to implement a personal strategy to dramatically impact your game so that you get greater enjoyment and satisfaction out of golf. Design your golfing destiny. 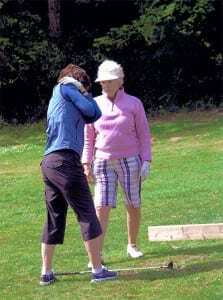 Tailor made golf instruction and support based on your needs. Jeri offers regularly scheduled Group Lessons where you will learn or review the basics. This golf series is intended for beginners or for those intermediate golfers wanting to get back into the swing of things. Bring your own group or join a group and meet new golfing friends. Who says you aren’t working just because you are on the golf course? The golf course is a great place to nurture relationships needed for business. Handled professionally, the time can provide a significant return on investment to the company. Mishandled, it can leave a negative impression that is difficult to overcome. To be effective, business golf requires as much preparation and attention to detail as any in-house meeting or sales call. Yet, most companies fail to provide the training necessary to use this valuable business relationship building tool. This unique seminar promises to raise your confidence level by introducing you to everything needed to get out there and successfully network on the course. Stretch your intellect, reduce your stress and expand your golf and business networking skills. And…..learn how to have fun doing it!